Federal Court Ruling in the Allah Case: What it Means? In my experiences in court, the examination of witnesses is a fascinating exercise. The goal is to arrive at the truth. However, truth can be subjective. The two parties in a case will have differing versions of what the truth is. Thus, the lawyer seeks to establish his client’s version of truth in his examination of witnesses. Each lawyer will have their own style in examining witnesses. The most popular is the aggressive and belligerent questioning of witnesses involving badgering and humiliation of the witness. I prefer a more subtle approach. But that is another story and I am not ready to reveal my trade secrets yet. On the day of our arrest, the JAIS officers verbally requested us to come to see them at their office. They did not say for what. But it was obvious that they wanted to record statements from us. When we were released on bail, the police issued a bail bond which required us to attend at an unidentified court on 10 January. I had discussed this in an earlier post. Section 13 of the Selangor Enactment says that an authorised officer making an investigation may by order in writing require the attendance of any person to have their statement recorded. Now, if I wished to be technical, I could point out that JAIS did not issue me an order in writing to attend at their office. So, technically I could refuse to attend. But what would be the point of that? If I did that, JAIS would merely issue me a letter and that would take care of the technical objection. So, sooner or later I would have to face them. At the police station I told the JAIS officers that I will come to see them. In fact, we discussed the dates and 10 January was chosen by me. As far as I was concerned, I was not afraid of JAIS or what they could or would do to us. I and my society also had nothing to hide. On top of that, as a Bible Society we wished to be seen to be obeying the Bible by cooperating with the authorities. If the state authorities take the position that the bringing in of our Malay bible with the word Allah in it is an offence under the laws of Selangor, then we will face the consequences. God has appointed us to take the hit on behalf of the churches and this was a task that we gladly accepted. Thus, on 10 January at 10.00 am, I went to JAIS’ office with Sinclair Wong, a BSM executive staff who was also arrested and requested to attend. Accompanying us was our bailor, Simon Wong, the General Secretary of BSM, and an officer from the office of Joseph Kurup, the Minister in the National Unity Department under the Prime Minister’s Department. JAIS is a pampered child of the Selangor State Government. The grandeur and prestige of their offices is testimony of this. As we drove towards their premises, we could not see their building as there was an tall embankment that looked like a hill slope covered with trees and thick foliage along the frontage of their premises. They were situated on the north side of the roundabout in front of the State Mosque in Shah Alam. We drove through the security at the front gate. In the middle of a sprawling sculptured compound were three tall towers topped with gleaming domes. A pasar malam was taking shape in the car park. It was a Friday and many stalls were being set up to catch the business of JAIS staff during the long Friday lunch hour. It was then I realised how big the operation and manpower of JAIS are in order to fill 3 big buildings and to have their own Friday lunch time pasar. Sinclair Wong (left) with me at JAIS offices. After meeting the band of reporters awaiting our arrival, we spent another half hour scaling one tower after another to find out where we were supposed to go to. Finally, we were told to wait at one office in the middle tower. It appears to us that JAIS had not expected us to come. As a result, no one knew what we were there for and eventually when we were shown to the right office, we had to wait for an hour for the questioning team to be assembled and for the room to be set up with video recording equipment. Finally, I was called into a medium size conference room with a circular table. There were three Malay gentlemen seated on one side of the table. They smiled at me and grunted out their names inaudibly as if they didn’t want me to catch it. One of them, a distinguished looking gentleman, appeared to be in charge. I asked him for his name and he said, “Malik.” No encik, no family name. One gentleman was recording what I said by hand. Another gentleman went in and out as directed by Malik to get this or that. Malik started by asking some details about me, my age, profession, am I married, what does my wife do, how many children I have, how old are they, are they working? Then he asked about my parents. All the time, Malik was very polite. Was this to disarm me with courtesy or was Malik just a nice guy? Then Malik asked about the background of BSM. I told him that we are registered under the Registrar of Societies in 1985 and before that we were part of a joint Malaysia-Singapore-Brunei Bible Society. He asked about my position and I told him that I am the chairman. He asked if I am involved in the operations of BSM and I said no. We have staff to do that. I come in for board meetings once in three months and the staff report to us what they are doing. Malik then said he understood as he also sat on some boards. How nice. Malik then asked why we have the Malay Bible. I explained that it is our function to supply bibles in all languages to churches in Malaysia. So, we have bibles in English, Mandarin, Tamil, East Malaysian dialects and Malay. I told him that we have over 2 million Christians in Malaysia and 60% or 1.2 million speak Bahasa Malaysia, the national language. They use the Malay Bible supplied by us. Malik had one of our Malay bibles on the table in front of him. He then asked me if it was all right for him to touch and pick up the bible. I said yes, no problem, go ahead. He picked it up and turned to the first page and asked who is the publisher of this bible. “ BSM, “ I answered. “Were you the chairman then? “ asked Malik. “Where was the bible printed,” Malik asked. “I don’t know,” I answered. “I don’t know,” I answered again. “Oh, you know about this,” I remarked. “One of my officers went to your bookshop and bought this bible. Did you know about this?” Malik asked. “No. I don’t,” I answered. “Yes, I know, “ I said. “When did you know that?” Malik asked. “When I became chairman,” I answered. With this Malik ended his questioning. If we disregard the initial niceties about me and my family, the questions about the bible took no more than 10 minutes. After Malik had finished all his questions, he asked if there is anything I want to say. “Do you want to have a look at the government stamp,” I said as I held out the bible towards Malik. I thought this was an investigation. Seeing Malik’s disinterest in a piece of relevant evidence offered by me, I decided it was time to end the conversation. The other gentleman brought what he had recorded to me and asked me to read it and if it was correct to sign it. I read it and then signed it. Malik and the others smiled and thanked me and I also smiled and said thank you. I then left the room. I waited outside as Sinclair went in to have his statement recorded. Following Christ under circumstances like these is extremely difficult. The selfish human will and wounded ego urges one to hit back and seek satisfaction for wrongs suffered until every last drop of the enemy’s blood has been shed. I hope that I was able to show the face of Jesus Christ to our Muslim friends in that brief encounter in JAIS’ office. Justice must not only be done but must be seen to be done. The enforcement of law must have the appearance of impartiality and integrity. Enforcers of a law must inspire confidence that their enforcement of the law will be fair, just and humane. I have already given a list of the actions which are considered to be offences and their punishments under the Non-Muslim Religions (Control of Propagation Amongst Muslims) Enactment 1988 of Selangor. Now we look at the enforcement of this law. Unlike ordinary civil law, the power to investigate offences and to arrest suspected offenders under the Selangor Enactment is not automatically to the Police. Instead, these powers of enforcement are given to an “authorised officer.” An authorised officer must be specially appointed by the Enactment. Section 10 of the Enactment gives the power to appoint an authorised person to the Ruler in Council. In simple terms, it means that the Sultan of Selangor meeting with and acting on the advice of the State Legislative Council appoints a “public officer,” that is, civil servants of the State or Federation, to be an authorised person. Of the 6 categories of authorised persons, only one is a civil authority, namely, police inspectors. The first four are high ranking officers of the Islamic hierarchy in the state. The fifth category include mid-level Islamic personnel in the state. The raid on the Bible Society of Malaysia on 2 January 2014 was not carried out by the police. It was carried out by the head of enforcement of JAIS and his subordinates. There were 2 police constables standing outside BSM premises but they never took part in the raid. They were onlookers. It was a JAIS officer who carried out the arrest. No police was involved. In any event, the 2 policemen standing on the road outside were constables and not above the rank of inspector and so could not be authorised persons under the act. There is something objectionable and inherently unjust in appointing Islamic religious officers of the state to enforce this Enactment against non-Muslims. Religious officers are inherently biased towards their religion and rightly so. They are the appointed protectors and defenders of their religion. Thus, in an event of an offence that is considered to be an infraction of the dignity of their religion, it is impossible for them to be objective. Thus, any investigation and arrest by them is invariably tainted with bias. In the enforcement of civil laws, a police officer does not investigate a crime when he is related to the victim. A judge does not hear a case when he is related to the parties or is involved somehow in the facts of the case. This is a basic proposition of law. We call this conflict of interest. Anyway, let’s go on with our discussion. Section 11 of the Selangor Enactment says that all offences are seizable offences. This means that a person suspected of committing this offence can be arrested. In a non-seizable offence, for example, running the red lights, the offender cannot be arrested but a summons must be issued to him to compel him to attend court. Section 12 says that an authorised officer may investigate the commission of any offence under the Eanactment and may arrest without warrant any person suspected of committing such offence. It is presumed that the raid of BSM, the seizure of the bibles and arrest of BSM officers were carried out under this section. Section 13 gives power to an authorised officer to require in writing any person to attend before him in connection with the case. If a person so ordered (that is, the witness) to attend fails to attend, a warrant of arrest may be obtained from a Magistrate to compel the witness to attend. Section 14 says that the authorised officer may examine orally the witness on the facts and circumstances of the case and the witness is bound to answer all questions truthfully. The only exception is that the witness may refuse to answer any question which would expose him to a criminal charge or penalty. The statement of the witness must be recorded and signed by the witness subject to the witness making any corrections he may wish. There were people who advised me not to go to JAIS office to have my statement recorded. Such persons were well-intentioned but were ill-advised in the law. The lawmakers in Selangor put the law in place in 1988 and then set up the enforcement machinery in 1999. They knew what they were doing and they made sure that they got all the bases covered. They had set a net so that when they cast it, the fish would not escape. This has nothing to do with the Malay Bible. But I can’t help but feel a sense of loss with the passing of colleague at the Bar and friend, Karpal Singh. So, here’s how I remember him. I called the office at Pudu Prison and arranged for an appointment to see Liew. When we met, he confirmed that what the newspapers reported was what happened in court. I listened as he told his story of how he got into crime. It was a pitiful story of a boy growing up in the slums and being influenced by the gangs. Soon he was committing crimes. The law caught up with him. Possession of firearms was a capital offence. Liew was not yet 30 as he faced the gallows. Since his case was over, I offered to write a petition for pardon on his behalf to the King. I would not charge him any fees. It was a favour to a fellow Christian. Liew agreed. Over the next one year, I would visit Liew. As he spoke no English or Malay and as my Chinese was vitually incomprehensible, I always brought along a Chinese pastor with me to encourage and minister to Liew. One day, Liew’s family called me. They said the prison had called to say that Liew will be hanged in 3 days time. I told them I would do what I can. I called the prison and then the palace to find out what happened to Liew’s petition for pardon. Eventually, I was told that it was rejected and the court had issued a warrant for his execution. I went to see Liew with his family. It saddened me that our friendship over the past year was coming to an end. Liew said that he had made his peace with God and he was not afraid. I asked him if he would consider doing some good with his death by donating his organs. He agreed. Over the next 2 days, I went to the General Hospital to find out the procedure and paperwork for this sort of thing. On the eve of his execution, I came to see Liew one last time and gave him some papers to sign to donate his organs. I bought him a meal from the prison canteen. Then we said goodbye and I told him we will meet again one day. I arrived home late in the afternoon, went to the backroom of my house and laid down on a bed. I did not want my wife and child to see the tears I shed for Liew. In 12 hours time, Liew will be taken from his cell (at 5.00 am the next day) and be hung by the neck till he was dead. I went to my front door and saw Karpal Singh and another lawyer, Ngeow Yin Ngee, standing at my front door. “Are you Liew Weng Seng’s lawyer?” asked Karpal. Karpal then explained that he was the lawyer for 2 convicts who were scheduled to be hanged at the same time with Liew. Karpal’s clients were found guilty of assassinating the Chief Police Officer of Perak. They had waited for him at a traffic junction in Ipoh and shot him to death when he passed by. Karpal said that he had filed a court case raising some legal technicality and had obtained an ex parte stay of execution from Judge Hashim Yeop Sani (ex parte means that the order was given after hearing only one side; later, the Judge would re-hear the case from both sides). When Karpal went to Pudu Prison to serve the order for the stay of execution, he was informed that there was a third man to be executed, Liew. It must have been about 6.00 pm when we drove back to Kuala Lumpur in Ngeow’s car. We reached Karpal’s office past 7.00 pm. He then started to dictate to his clerk who typed furiously on the typewriter. I gave them Liew’s details. I was still in a daze. All the time, Karpal worked at preparing the papers like a man consumed and trying to beat a deadline. We must have finished the paperwork at about 9.00 pm. It was 8 hours to the execution. “Let’s go see the Judge,” Karpal said. The first place we went to was the home of Madam Harwanth Kaur, the Senior Assistant Registrar to Judge Hashim. We bundled her into the car and four of us drove to the home of Judge Hashim in Petaling Jaya. We reached his house at 10.00 pm and Karpal banged on his door. We were let into the Judge’s living room. “The Attorney-General will jump!” sniggered Judge Hashim as he signed an order for the stay of Liew’s execution. 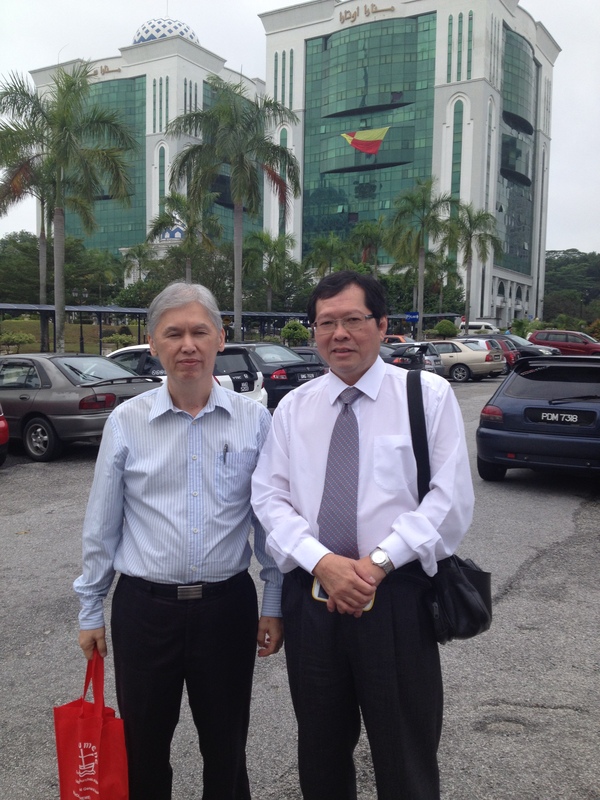 We then left the Judge’s house and drove to the High Court at Kuala Lumpur. It was 11.00 pm when we arrived. The courthouse was in total darkess and tightly shut. We found the security guard and Harwanth ordered him to open the court doors. Four of us went into the registry section of the court house. We were looking for the court seal. The court order although signed by the Judge was no good without the seal of the court imprinted on it. The four of us fanned out to look for the court seal. It was a stroke of good fortune that we found the court seal in a short time. Harwanth sealed the court order and handed it to Karpal. We left the court house but first we had to send Harwanth back home. Her job was done. Karpal duly served the order for a stay of Liew’s execution on the prison director. The next day, the papers reported a sensational last minute rush to save 3 men from the gallows. Within a week, we were back in Judge Hashim’s court. The Attorney-General, Abu Talib Othman, did jump and he made an application to the Judge to set aside all 3 stay orders. Karpal argued the case with his usual brilliance. I cannot remember the legal point. All I can remember was that it was never argued before. Karpal had no previous court decisions to rely on. It was like going back to school to see Karpal at work and the lesson: “Think outside the box.” At the end of arguments, the Judge set aside the 3 stay orders clearing the way for the men to be executed under a fresh warrant. Karpal appealed to the Federal Court. Again, it was dismissed. Let me pause awhile. Throughout this time, Karpal did all the work for Liew’s case, paid for all the court expenses and made sure I was always present to take part. He never once talked about payment. It was as if he was meant to do this. A few months later, warrants of execution were issued again. Judge Hashim had ruled that the High Court could not order a stay of execution. It must be ordered by the Attorney-General who was the chairman of the Pardons Board. Karpal made appeals to the Attorney-General but it fell on deaf ears. On the eve of the execution, Karpal summoned Ngeow and I to his office. It was about 8.00 pm when we got there. Karpal did a lot of things at night as he would be in court the whole day doing more than one case per day. He suggested we go to see the ambassadors of the European countries to seek their help to persuade the government to delay the executions. Karpal had discounted the US ambassador as the Malaysian government under Dr Mahathir was hostile to the US. However, the government had good ties with the Europeans. We went to see the German ambassador. He informed us that the European embassies have a system where they would appoint one of the European ambassadors on rotation as a representative to speak to the Malaysian government on behalf of the rest. At that time, the French ambassador was the chairman. So, off we went to the French ambassador’s house. I cannot remember the conversation as it was a long time ago. But the ambassador told us that he was not able to help. We went back to Karpal’s office at midnight. 5 hours to the execution. Karpal was wracking his brain to think of something. I was exhausted and had almost given up but I hoped that Karpal would again pull something out of his hat. How about this? No, won’t work. How about that? On and on we went. At about 2.00 am, 3 hours to execution, Karpal said that there’s nothing more we could do. He asked us to go home. A few hours later, Liew and the other 2 convicts were dead. Lawyers can be the most heartless of men. Society had a reason for calling lawyers sharks. Its because we thrive on the misfortunes of others. Most lawyers I met are in it for the money. They have no heart for their clients who they see to be nothing more than a source of income. Karpal was not like that. In my encounter with him over Liew’s case, Karpal demonstrated true humanity and a genuine care for his clients. Whatever their crimes were, he saw them as human beings and felt a sense of responsibility for them over and above the call of duty. Karpal Singh was a true humanitarian. We will miss him. There may still be many who want to do the work of God in Selangor and who are prepared to suffer the consequences. For such people, I wish to let you know what you are in for. For those whose religious conviction tells them that they must follow God rather than man, I say to you that you have not chosen a wrong path but that you walk in the footsteps of the martyrs, the apostles and Jesus Christ Himself. The Bible Society of Malaysia (BSM) expresses its greetings to the Christians and Churches in Malaysia who are observing Holy Week. Recent announcements from Selangor State EXCO has confirmed BSM’s belief that the environment in the state of Selangor has become unconducive for BSM to carry out its work of supplying bibles to the Christians and Churches of Malaysia. Since the raid by JAIS on BSM’s office on 2 January 2014 together with the seizure of 321 copies of Malay and Iban bibles and the arrest of two of its officers, the Selangor State Government have demonstrated their lack of interest and will to address the unjust situation of state Islamic agencies taking unwarranted action against non-Muslim religious bodies for exercising their legitimate rights under Article 11 of the Federal Constitution. BSM wishes to put on record that since the announcement of the Ten Points Solution by the Federal Government in April 2011, BSM had imported 400,000 copies of the Alkitab, the Bahasa Malaysia Bible, into Malaysia for use by Christians and churches. This arrived in 21 shipments over a period of 2 years. On each occasion, these shipments of BM bibles were cleared by KDN at Port Klang without delay and without any problems. BSM commends the Federal Government for not only faithfully honouring the Ten Points Solution but respecting the rights of religious minorities to have access to their holy books in the Malaysian languages. Unfortunately, the stand taken by the Selangor State EXCO to justify and to support the actions of JAIS is a clear signal that JAIS will continue to act as a free agent against non-Muslim religious groups and bodies in Selangor. BSM had called for and hoped that Selangor State EXCO will follow the good example of the Federal Government by adopting the Ten Points Solution in their administration that will put an end to inter-religious tensions in the state of Selangor. Unfortunately, this has not been forthcoming. Therefore, BSM wish to announce that it will be moving its headquarters and operations out of Selangor to the Federal Territories where better protection is given by the Federal Government to religious minorities. By moving to states where the Ten Points apply, BSM hopes to avoid incidents like that of January 2 that could disrupt the operations of BSM in supplying BM bibles to Christians and churches throughout Malaysia. Apart from the change of our base, it will be business as usual for BSM. However, we will no longer be importing Bibles through Port Klang, Selangor but we will ship BM bibles directly to East Malaysia where most of the BM bible readers are. As for West Malaysia, we will ship through the state of Penang which does not have a law like the 1988 Selangor Enactment. Christians and churches who wish to obtain BM bibles from BSM will have to get them from BSM’s outlets to be established in Kuala Lumpur, Penang, Kuching, Miri and Kota Kinabalu. Christians residing in Selangor will have to personally undertake the risk of transporting and using the BM bible in Selangor territory. For the rest of the country, we do not anticipate such problems. The timing of this transition and the location of BSM’s new offices will be announced in the Christian media in the near future. BSM calls on Christians to remember the spirit of this Holy Week. During his crucifixion, Jesus Christ prayed to God for forgiveness for his persecutors. As we remember the sufferings, death and resurrection of our Lord Jesus Christ this week, let us forgive all those who have wronged us and pray that they will receive God’s grace and salvation as we have. American poet Robert Frost wrote a famous poem of chancing upon two divergent paths in his walk in the woods. He wrote that he took the path less travelled and it has made all the difference. I have lost count of the number of people I’ve met who defined their life’s achievement by Frost’s “road less travelled.” I imagine that if I were ever to discover that road, it would be choked by a massive human traffic jam. Recently, Nelson Mandela died. Throughout the world, people like Najib and Dr Mahathir not only shared about the time they met him but tried to hint that they too are like him: little Mandelas. I think God broke the mould when he made Mandela. The truth of the matter is that non-conformity is not as commonplace as we think. That is why it’s called non-conformity. It’s rarity lies in the price that has to be paid for breaking ranks with the majority. At the height of the Al-Kitab issue in March 2011, the Bible Society of Malaysia refused to allow its Malay Bible to be turned into a political issue. When the Ten Points Solution was offered, BSM ended its stand-off with the Government, collected its detained bibles and forgave the Government over the incident. Many in the Christian community were extremely unhappy that BSM by its actions took the wind out of the sails of a scandal that could have a damaging effect on the performance of the Government in a coming state election. A leading evangelical organisation decided to put BSM out of the Malay bible business by making plans to order Malay bibles directly from BSM’s supplier to compete with BSM. A leaked e-mail showed that they had a problem with the expense of such a project. Their solution: to ask BSM to give them the money so that they can put us out of business. In any event, we had no money to commit this kind of suicide. The Ten Points Solution left us with the happy situation of the Government undertaking not to interfere with our future imports of Malay bibles. However, we had no money to buy more Malay bibles. The batch of 5,000 bibles cost us RM70,000 and we had waived compensation from the Government as a demonstration of the sincerity of our forgiving them. That was a pretty big hole in our bank account. What were we to do? There had been no supply of Malay bibles in the country since 2008. The shipment that came in 2009 was to meet that need. It was detained for 2 years and in 2011, it was spoiled and not fit for sale. With serial numbers, these bibles were potential snares for the buyers. It looked like the famine would go on. Had the opponents of the Al-Kitab finally won their victory? It is when we are totally helpless that God acts. Within days, BSM received an offer to fund the purchase of Malay bibles provided that they be distributed free of charge. BM-speaking Christians are among the poorest in the Christian community. What an apt reward for the 1.2 million BM-speaking Malaysian Christians who had faithfully prayed for years that God will end their bible drought! An order for 100,000 Malay bibles was immediately placed. The cost: RM1 million. Within months, the first shipment arrived at Port Klang. We waited with bated breath to see whether it would make its way past KDN officers at the port. Will the Government honour the Ten Points Solution? The bibles were immediately inspected by KDN as expected. Within two days, they were out of the port and on its way to BSM’s office. A few more shipments arrived some months later. They too cleared the port without problems. The following year, 2012, BSM believing that God will provide more than He did in 2011 ordered 300,000 copies of Malay bibles at a cost of RM3 million. Then we informed the Christian community and within months every last cent that BSM needed was provided. This massive order was delivered on a staggered basis, arriving every few months. Like the year before, every shipment was cleared immediately by KDN without delay and without incident. Thus, in a space of 3 years (2011-2013), God had provided 400,000 copies of Malay bibles to BM-speaking Christians in Malaysia. We call this the 1M Al-Kitab Project (1M stands for 1 million). By God’s grace, the Federal Government had kept its promise contained in the Ten Points Solution. Also, in 2011, a young seminary professor, Dr Lim Kar Yong, made the discovery that the Malay bible was first translated in 1612. This made the Malay bible the first bible to be translated in a non-European language. What a feather in the cap for the Malay bible! Thus, in 2012, BSM celebrated the 400th Anniversary of the Malay Bible with joint functions with bible seminaries in Seremban, Petaling Jaya and Kota Kinabalu culminating in a anniversary dinner in November graced by 800 people including church luminaries. What little that God took away in order to test us, He has replaced in numbers beyond our imagination. Also, the unhappiness against BSM over the 2011 incident evaporated the following year with the success of the 1M Al-Kitab Project and the closing of ranks as seen in the celebrations over the 400th Anniversary of the Malay Bible. At the end of 2013, we decided to call time-out on the project. It was time for a well-earned rest or so we thought. God had other plans. The raid by JAIS took place on 2 January 2014. This is a reminder from God that the struggle is far from over and the task is not completed. From the story I just told, what do you think? I had opened a Pandora’s Box when I issued a protest statement on behalf of BSM on March 16, 2011 accusing KDN of desecrating our holy books by stamping them and marking them with serial numbers. In spite of Idris Jala’s press statement on March 22 about the concessions to be made by the Federal Government, the tide of Christian anger refused to abate. The issue was played up by opposition parties in anticipation of the Sarawak State Elections due to be held in early April. On the evening of Wednesday, March 23, over 3,000 Christian pastors attended a rally in Kuching. They expressed extreme disgust with the Government’s treatment of the Al-Kitab. Their mood and their influence over Christian voters in Sarawak spelled potential disaster for the ruling party in the approaching state elections. On the other side, UMNO politicians defended the Government and belligerent media statements issued from Nazri Aziz, a cabinet member, Pembela a fundamentalist Muslim lawyer group and the Mufti of Perak. On Friday, March 25, Idris Jala called BSM and informed us that the Government had basically agreed to the 2005 position. Now, what is the 2005 position? In 2003, KDN detained 1,000 Al-Kitabs. In order to break the impasse, CFM suggested that in future all Al-Kitabs will carry the symbol of the cross and the words “Penerbitan Kristian” (A Christian Publication) on its cover. This was accepted by then Prime Minister Abdullah Badawi in a letter to the head of CFM. At this stage, the Government had conceded to all the demands made by BSM. As for the unfortunate incident of the stamping of our bibles, the Government had offered to compensate us for it. Added to that was one more concession which we did not expect, namely, in order to prevent a recurrence of this incident, the Government would take disciplinary action against any civil servant if they detain Al-Kitabs which complied with the 2005 agreement. It appears that the Government had agreed to everything we asked for and more. The next day, on Saturday March 26, the BSM exco attended the funeral of past-president, Mr Diong Chin San. We discussed the latest Government offer and felt that with this offer, we had achieved all that we had asked for. Tensions were still running high and a CFM meeting due to be held on March 29 would probably produce a strongly worded media statement against the Government that may worsen the Christian – Government/Muslim relations. We did not feel comfortable about our bibles remaining in KDN custody and feared the possibility of further desecration or even possibly destruction of our bibles if the situation got out of hand. Thus, we decided that a closure of the issue for BSM was necessary with the immediate collection of our bibles before anything else could happen. On Monday March 28, BSM informed CFM of our decision to collect our bibles. However, on the request of the head of CFM, we decided to postpone it till after CFM had met on March 29. This meeting had been called to consider the Government’s offer to resolve the Malay Bible issue as communicated by Idris Jala. CFM met on the afternoon of Tuesday, March 29. BSM and Gideons, the bible importers who had their bibles detained by KDN were invited to address the meeting. There was a range of views over how the Christians should respond to the Government’s offer. On behalf of BSM, I informed CFM about our intention to collect our bibles. The overwhelming majority preferred BSM not to do so. I was not agreeable to this. Leaving the bibles with KDN would only keep the detention of our bibles alive as a political issue especially with the Sarawak State elections due in 2 weeks time. I insisted that BSM must not get involved with politics. If it is time to collect the bibles, then we will collect our bibles. After all, the Government had completely capitulated. At the end of the meeting, CFM decided to leave it to the importers whether to collect their bibles or not. “In view of KDN’s tendency to take arbitrary action without consultation of affected parties or respect for the religious sensitivities of the Christian community, BSM decided to collect the 5,000 copies of the Al Kitab to prevent the possibility of further acts of desecration or disrespect being committed against the holy books of the Christians by KDN and its officers. The 5,000 copies of the Al Kitab that have been defaced by KDN cannot be sold to Christian buyers. Instead, they will be respectfully preserved as museum pieces and as a heritage for the Christian Church in Malaysia. This unfortunately will result in a loss of RM70,000 for BSM. The issue started to subside in the press when BSM collected the detained Al-Kitabs. The Malay Bible may be imported or printed locally. For East Malaysia, taking into account the large Christian community, no conditions will be attached to the importing and printing of the Bible in all languages including Bahasa Malaysia. For West Malaysia, taking into account the interest of the larger Muslim population, bibles imported or printed in Malay or Bahasa Indonesia must have the words “Christian Publication” and the cross imprinted on its front cover. There are no prohibtions or restrictions on Christians bringing their bibles with them when they travel between West Malaysia and East Malaysia. A directive has been issued by the Chief Secretary of the Government to ensure compliance with the Cabinet decision. Failure to do so will subject government officers to disciplinary action. The owners of the impounded bibles can collect them free of charge and the Government will ensure that they be reimbursed. At the end of his media statement, Idris made a startling and unprecedented remark. He called on the Christian community to forgive the Government over this incident. In all my years, I had never seen the Government, firstly, admitting they had done anything wrong, and, secondly, asking to be forgiven. As I drove to a church in Kuala Lumpur which had invited me to give a sermon on the topic “Grace,” I wondered what should be the Christian response. In my sermon to the church, I asked them what they thought and suggested that they may speak with me about this after the service. A group of us gathered round to discuss this. The crucial question that came to our minds was: What would Jesus do? “BSM deeply appreciates the Government’s 10-point solution which is not only an affirmation of the 2005 agreement but also include additional safeguards to ensure that incidents that have recently been the bone of contention should not happen again. A few days later, The Ten Points Solution was formally communicated to the Christian community in a letter from the Prime Minister addressed to the head of CFM.